Arriving April 5th, from classic rock icon Todd Rundgren is a new live album titled "Live At The Chicago Theatre." The show celebrates his band Utopia, which originally formed in 1974. 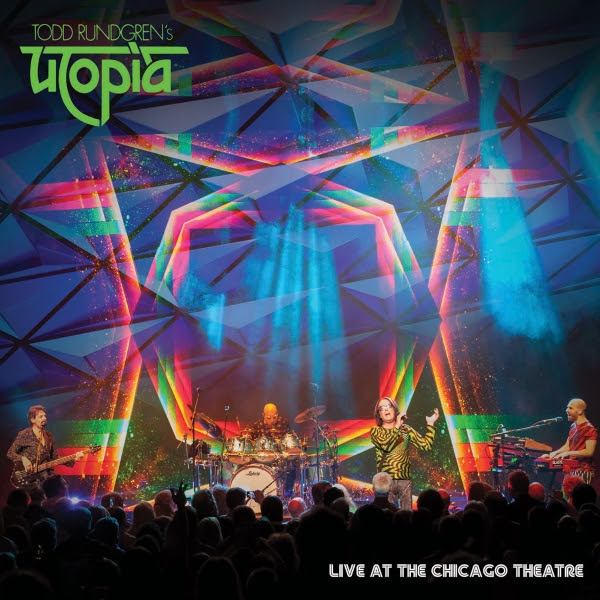 It has been over thirty years since Rundgren has performed strictly Utopia music live, and for this special occasion the entire concert was filmed in high-definition for this new special release. The new deluxe edition features a Blu-Ray, DVD and 2 CDs, while a special edition green double-vinyl version will also be released, but two weeks later on April 19th. The show kicks off, much like Utopia's debut album, with the 14-minute, mostly instrumental "Utopia Theme." Todd Rundgren is joined onstage by Kasim Sulton (bass), Willie Wilcox (drums) and Gil Assayas (keyboards). The band perform a shorten version of "The Ikon," before rocking out to a cover of Electric Light Orchestra's "Do Ya." Utopia keep the energy flowing with "Freedom Fighters" and "Back On The Street," as this latest version of Utopia have the perfect chemistry. The first disc closes with the progressive rock appeal of "Overture/Communion With The Sun" and the more aggressive rocker "Last Of The New Wave Riders." The show continues with the "Road To Utopia," which originally kicked off the band's 1979 album "Adventures In Utopia." Todd Rundgren's Utopia dives into their eighties catalog with the songs "Play The Game," "Swing To The Right" and "Princess Of The Universe." Utopia's two most successful singles "Set Me Free" and "Hammer In My Heart" finally find their way into the set list, as the audience appreciates the trip down memory lane. Todd Rundgren's Utopia finish up the show with the popular ballads "Love Is The Answer" and "Just One Victory." Todd Rundgren is heading out on a two month tour, beginning April 3rd in the Netherlands, before hitting the U.S. the following week. For a complete list of tour dates and to find out more about the new release from Todd Rundgren's Utopia "Live At The Chicago Theatre," please visit his Facebook page at facebook.com/toddrundgren.